Humans are living longer, healthier lives. That’s great, but there’s a downside — the growing elderly population requires an entire industry of (expensive) caregivers, and we’ll likely need even more of them in the future. Care robots might be able to do some of that work. Researchers suspect robots could help elderly people with everything from staying active to remembering their medications. Now researchers in Europe and Japan are working to make sure those robots don’t offend the people they’re supposed to take care of — they’re making what they say are the world’s first robots with a sense of cultural norms. The culturally sensitive robots are the work of Culture-Aware Robots and Environmental Sensor Systems for Elderly Support (CARESSES), a project funded by the European Union and Japan’s Ministry of Internal Affairs and Communications. 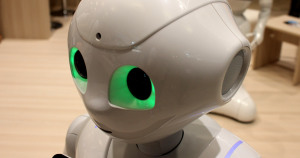 Researchers programmed a SoftBank Pepper robot to adjust its behavior to conform to the cultural background of the person it’s interacting with. According to CARESSES’ site, for instance, the robot would know not to suggest steak for dinner to a person who practices Hinduism, or would know how an elderly Japanese woman might want to celebrate the springtime festival of Setsubun. The researchers don’t detail how the robot will know the elderly person’s cultural background. Presumably, someone would provide the robot with the information beforehand. But the hope is that the elderly person will be more likely to accept the care robot into their life if the bot can cater to their unique culture and customs. The CARESSES team is trying out its culturally sensitive robots in retirement homes in Japan and the U.K.
“We’ll be examining if people feel more comfortable with robots that take into account their culture and if their presence increases the quality of life of the elderly,” CARESSES researcher Alessandro Saffiotti said in a press release. Saffiotti thinks CARESSES could help more people than just the elderly, too. “Already today, robots are present in our lives. They’re found in our schools, hospitals, our homes and businesses, and we believe that if they are also culturally competent, they will more easily be accepted by the people they interact with,” he said. So, if the CARESSES testing goes as hoped, we could see culturally sensitive bots cropping up everywhere, not just in retirement homes.